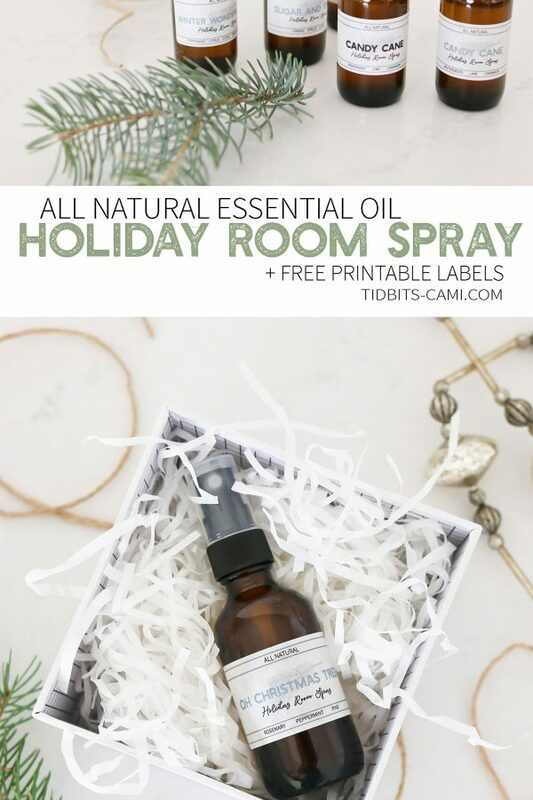 If you could bottle up the Christmas Season, it would look just like this DIY gift idea – all natural essential oil Holiday Room Spray. 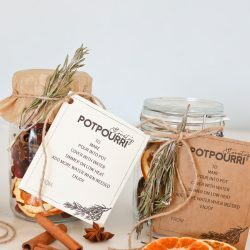 I have 4 varieties plus free printable bottle labels to make your unique and smelly-good gift really something special! 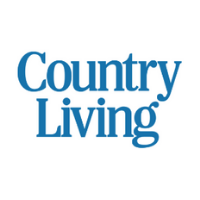 *Disclosure: I am an affiliate for Rocky Mountain Oils, which means if you use my links I will get a percentage of the sell at no extra cost to you. Thank you! Affiliate income is a large part of why I can provide this free content for you! My husband always tells me that I have a sniffer better than any dog. But it’s true, my nose can catch the wind of any stench a mile away – both a blessing and a curse. What it really means is that smells illicit strong memories for me, and I imagine you might feel the same. This is probably also why I adore essential oils so much. Pure, whole and natural therapy for my senses, and I wanted to find a way to enjoy them more this Holiday Season and share that with my loved ones. 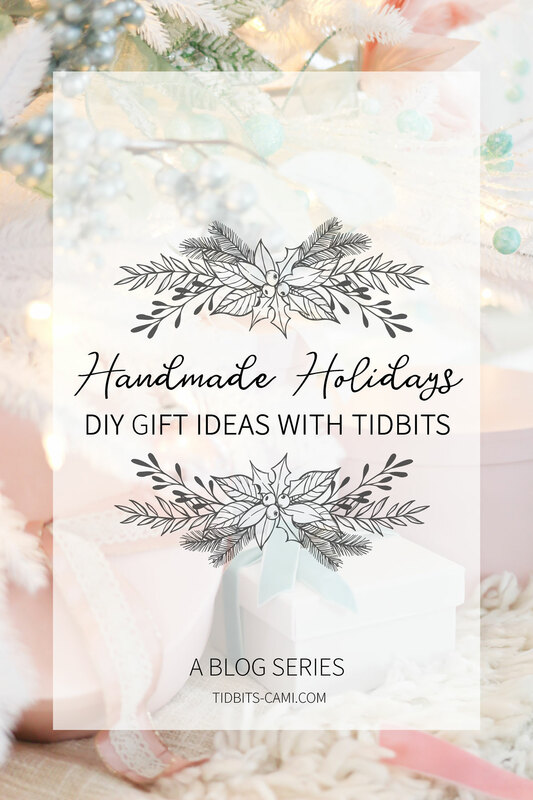 You might have caught on already, but this Holiday Season I’m diving deep into sharing many DIY gift ideas with my blog series called “HANDMADE HOLIDAYS“. I’m so excited to share with you what I’ve been making for friends, neighbors, teachers, family, etc. and hope you’ll come away with many ideas to make your gift giving even more special this year. 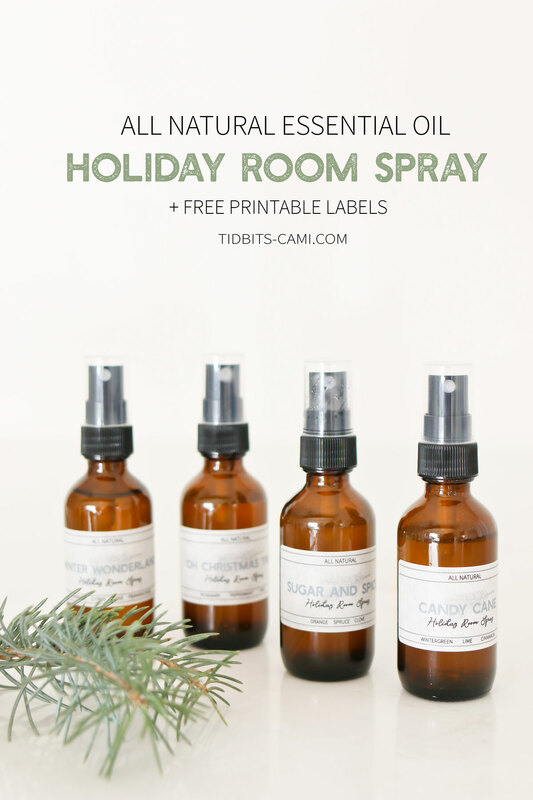 When I had the idea to make Holiday Room Spray complete with free printable bottle labels (grab that printable below! ), I knew there were many yummy essential oils that would smell like wonderful Christmas memories . . . peppermint, pine, spruce, cinnamon, orange, etc. 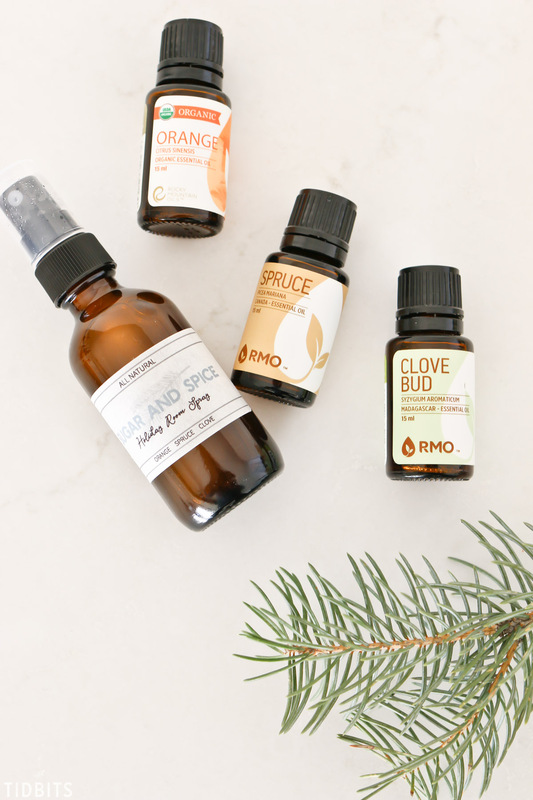 I wanted to get the blends exactly right, which is why I begged my friends over at Rocky Mountain Oils to bring on their blending experts to help me create some dream Christmas blends for the room sprays. And boy did they deliver!! 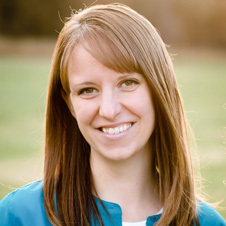 I love Rocky Mountain Oils for so many reasons, which you may have heard me talk about HERE. 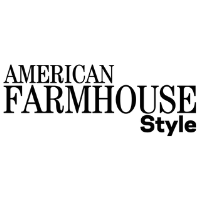 They are knowledgeable, helpful, and have incredible prices on their pure oils without making you feel like you need to commit to monthly purchases. Rocky Mountain Oils is NOT an MLM (multi-level-marketing) and they always have FREE shipping and great freebie offers. 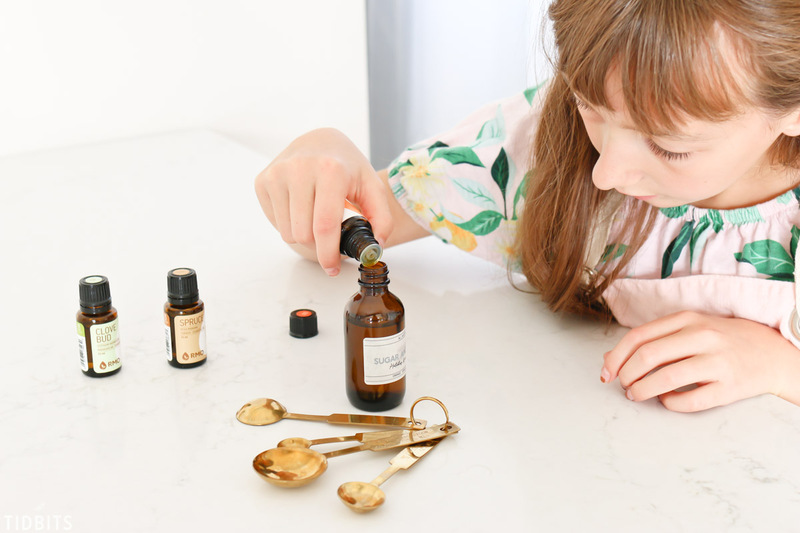 Whether you just want to dabble in essential oils with a few purchases, or you want to slowly stock your supply, I 100% believe the best place to purchase is with Rocky Mountain Oils (and you can trust me, I’ve tried many different companies!). So let’s take a look at the 4 different varieties of blends Rocky Mountain Oils helped me come up with and share with you. 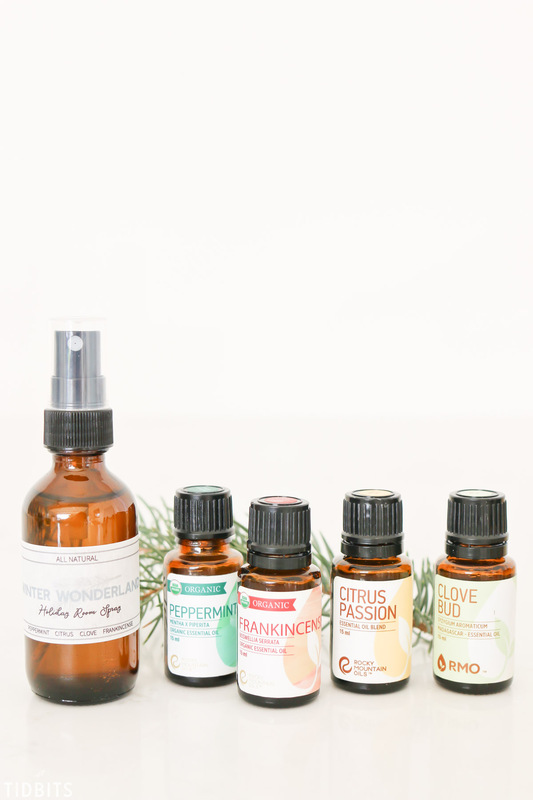 These blends also work great in diffusers, by the way (kinda like my 10 Fall diffuser blends)! I will leave a printable “recipe” below so you can easily create your sprays. I think my favorite, favorite blend is SUGAR & SPICE – oh it smells soooo nice! Whether or not you chop down a real tree, this blend, OH CHRISTMAS TREE, can make any room smell like a Christmas forest! The blend CANDY CANE smells good enough to eat! You can sub out the wintergreen for peppermint oil, and both smell equally delicious. Half my family is team wintergreen, the other half team peppermint. WINTER WONDERLAND is a delight to the senses and combines so much that I love about Christmas in a soothing way. 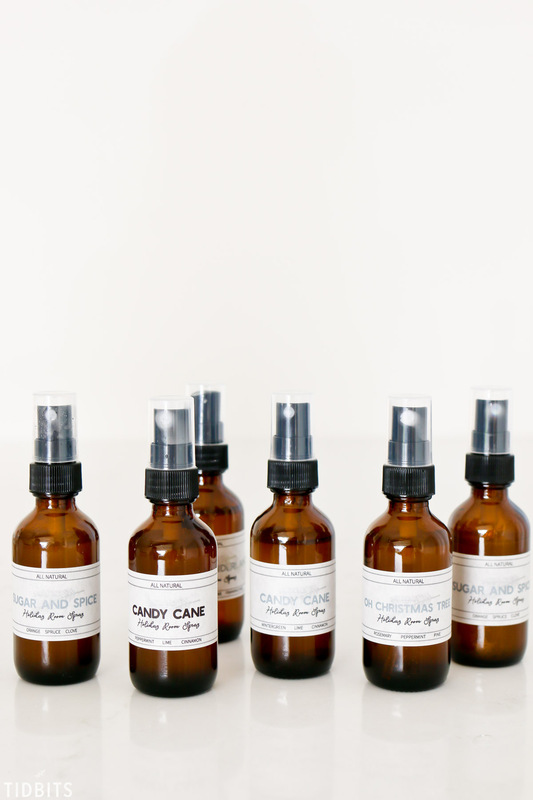 You can’t go wrong with any of these blends for your DIY gift spray. 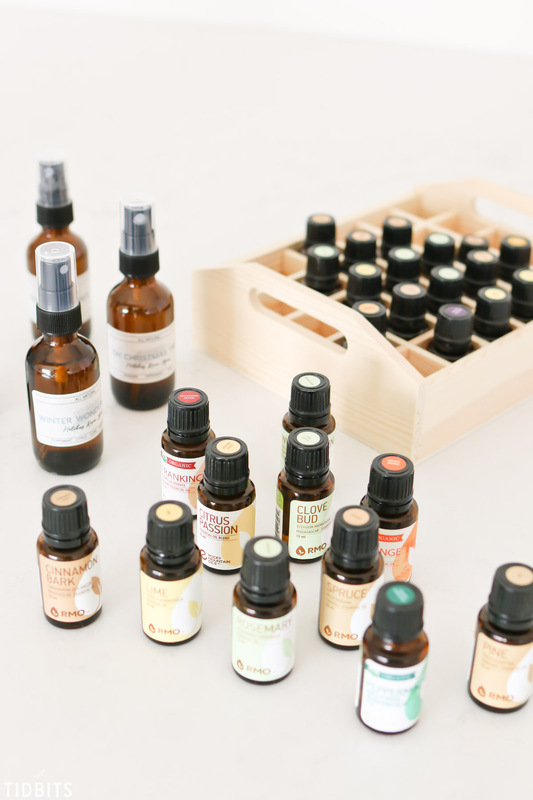 Pick one and order the oils for that, or go all out and experiment with all of the blends! 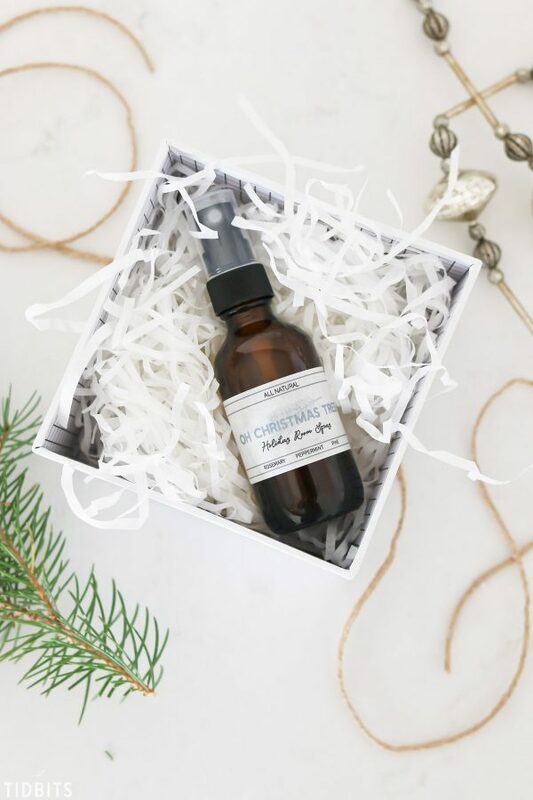 Considering you can get a whole ton of drops out of these little bottles, this can really be a cost effective gift you can make in bulk. 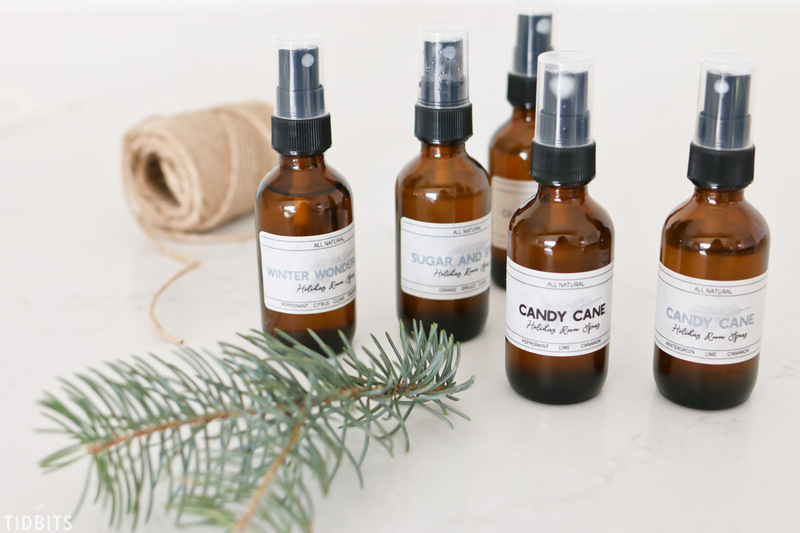 Let’s go over the supplies you will need for the Holiday Room Spray. Most of what is in the bottle is water, which is another reason this is very cost effective. 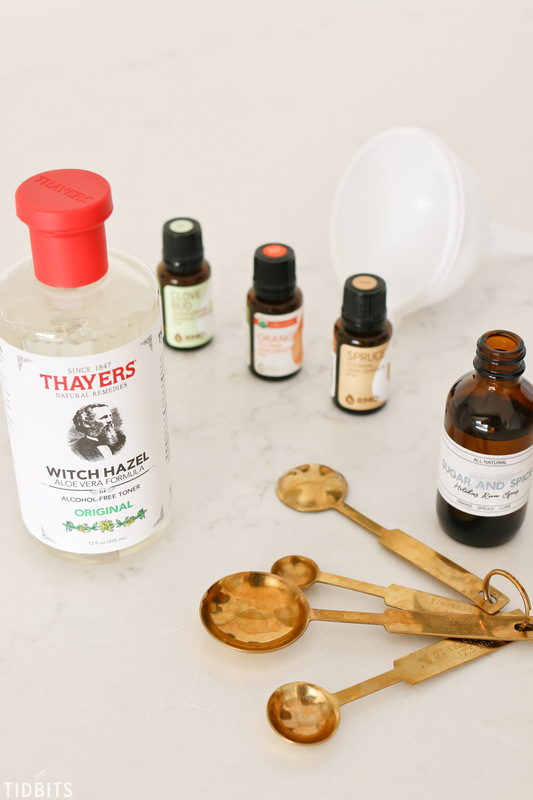 Witch Hazel acts as an emulsifier and helps distribute the oils in the water evenly, so you get an even smell with each spray. I still like to give my bottle a shake before I spray. You can also use rubbing alcohol or salt, but I much prefer the results of the Witch Hazel. I have detailed how many drops you need for each bottle below. 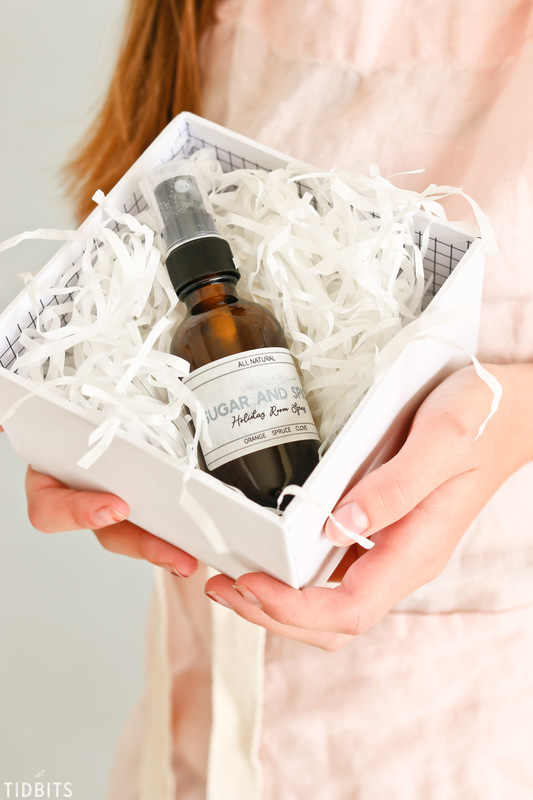 You could essentially make a very large bottle of room spray, but for gifting purposes these 2 oz. bottles from Amazon are perfect. These are the exact labels I used for my bottles, and the labels I designed my printables to fit perfectly. 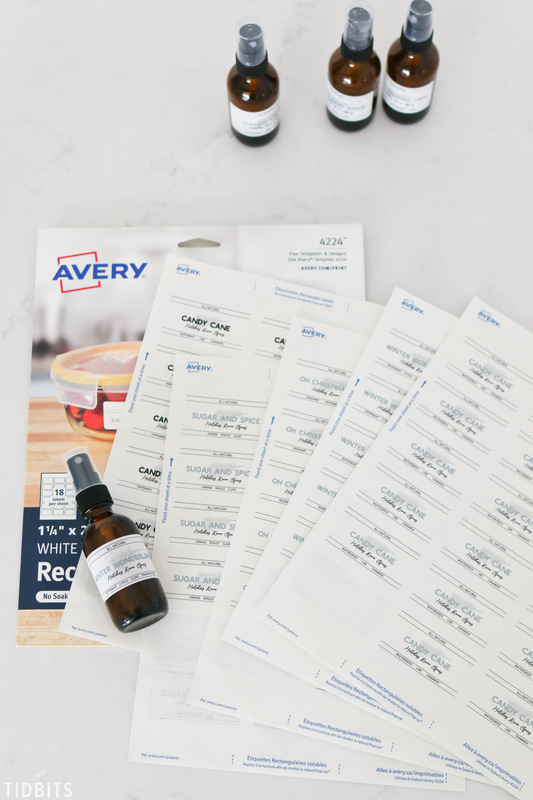 Any other small rectangle label could work if you adapt the downloadable design, but for perfect results on my printables, I highly recommend purchasing these dissolvable Avery Labels. 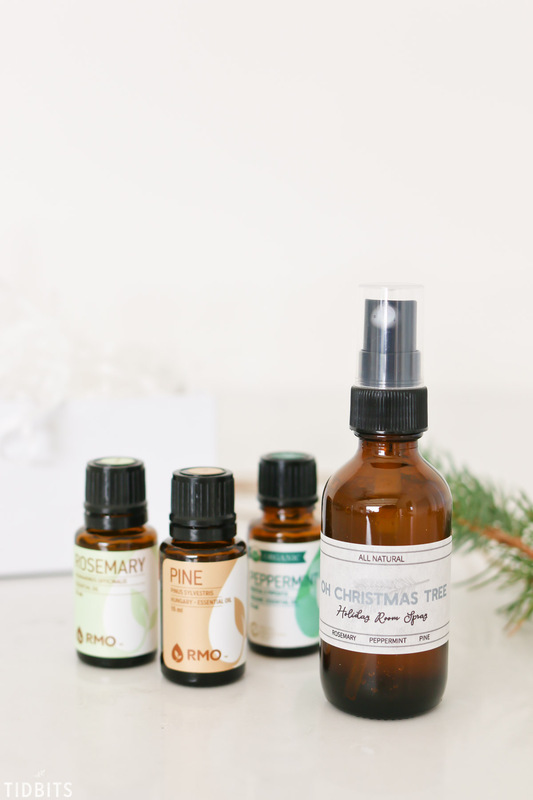 Making the Holiday room spray is easy enough for the whole family to get involved, however you do have to be careful they do not get the essential oils directly on their skin as it may be too strong without being diluted. 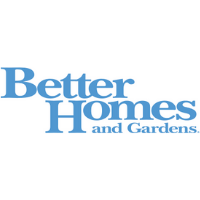 First, fill your 2 ounce glass bottle up with filtered water about 3/4ths of the way full. Next, add 1 teaspoon of Witch Hazel. 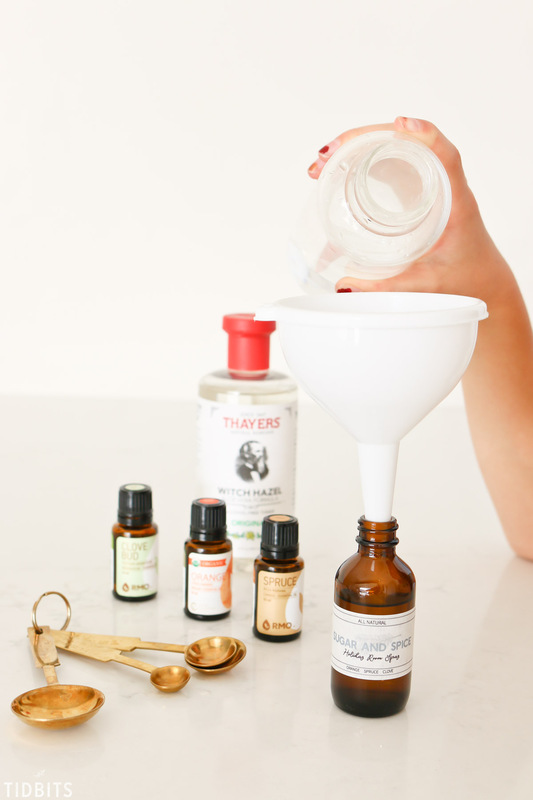 Add the recommended drops of essential oils, carefully counting each drop. Securely twist on the lid and give the bottle a good shake and a test spray. 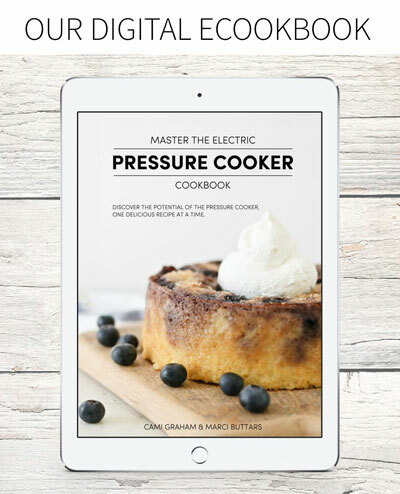 All my FREE printables are a perk I offer my email subscribers! If you are not already a subscriber for my blog updates, you can fill out this form below to gain access to the TIDBITS SUBSCRIBER LIRARY where you will find all these free printable labels in both a blue and black font option – available for immediate download. *Already a subscriber? No need to fill out the form again. The link and passcode can be found at the bottom of every email I send. I’ve also given detailed instructions on how to use Avery.com to upload my PDF designs for the labels, and print them directly on the sticky labels. 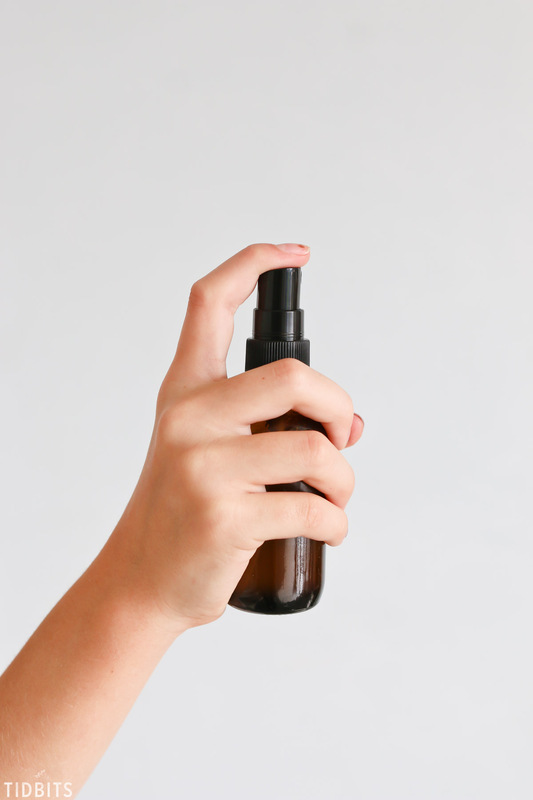 View or print this “recipe” to help you make your room sprays. Please remember, measurements are meant for a 2 ounce glass bottle. Adjust to your bottles accordingly. 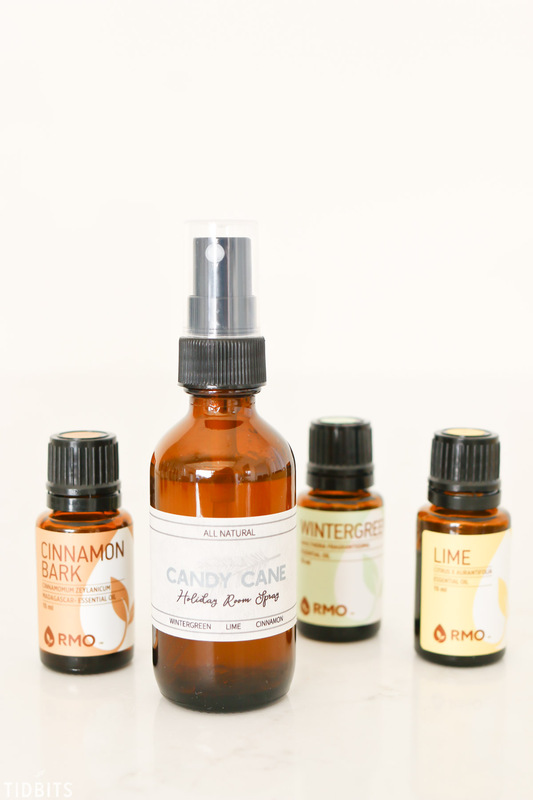 4 varying essential oil blends and ingredients to make Holiday Room Spray. 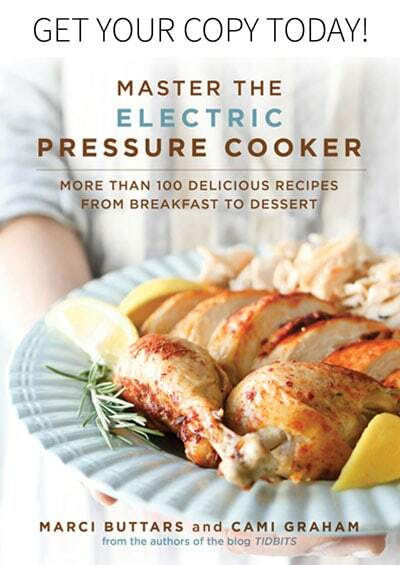 Recipes are designed for a 2 ounce bottle. 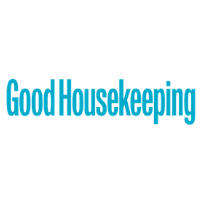 Fill bottle up ¾ths of the way with filtered or distilled water. Add one teaspoon of Witch Hazel. Add drops of essential oils, according to measurements above. Seal the bottle and give it a good shake. There ya have it! 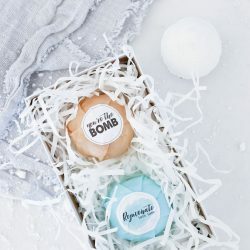 A unique and deliciously smelling gift for anyone on your list! 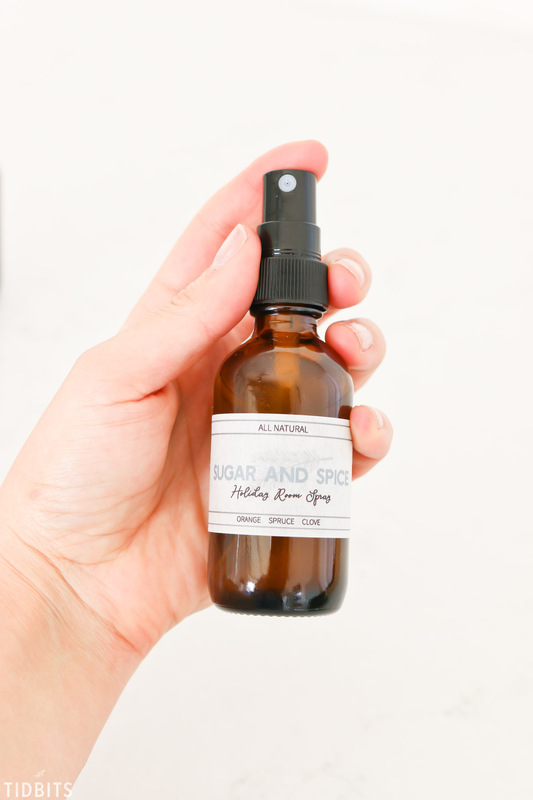 Spray it in your home, on your bedding, as a car freshener, and even on your clothing for perfume! 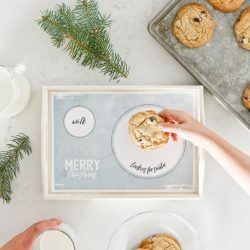 I hope you enjoy and you can bet I’ll be back with more DIY gift ideas! For now, be sure to PIN THIS POST so you can easily come back to it! FYI: This project was photographed on my new Hanstone Quartz Countertop and wall on wheels in my garage! Cool huh?! 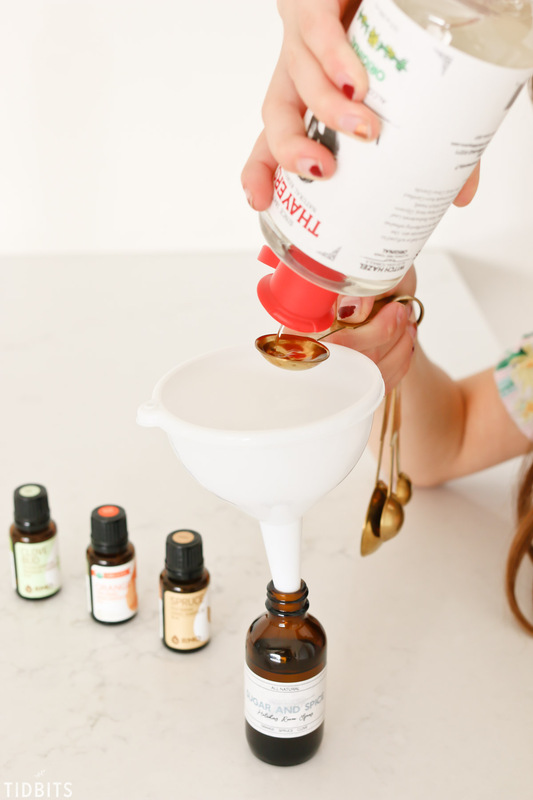 I’ve never done anything with essential oils but now I know how! So glad you like it! This is a very easy and rewarding way to dabble into oils. The smell can’t be beat! Thank you for saying so Ardith! What sweet compliments! Big hugs! This is a great page! I would like to make each of these and put them in smaller bottles so that I can spread the cheer even further. My question is- which oils, in what ratio, could I sub for Citrus Passion? I have many citrus eo’s but I don’t buy blends because I make my own. Thank you for your time. Be blessed and grateful. 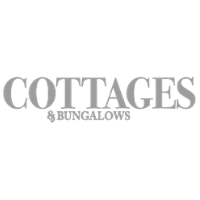 Yes, you really could make the most of this! I’m so glad you liked the idea! The citrus blend is simply made up of orange, grapefruit, lemon and lime so you could easily blend those in as well. Hope that helps! What an awesome post. Oh! Also! Just last night Rick was reacting to my latest linen spray and saying how it was causing his heart to race and making it hard for him to breathe…. (I quite LOVED it myself!!) 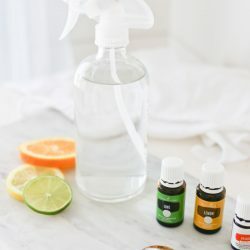 So I decided last night that I would research a DIY linen spray and so imagine my surprise when I saw your post this morning!!! I’m totally using this for my linens too. So much better than chemical fragrances! Love ya!! It was about 3 years ago I started noticing 1 daughter who seemed really sensitive to all the cleaners and sprays I was using. Then I began to take note on how so many of them congested me and even set on migraines. It’s been a learning transition since then. I love yummy smells, so I’m so glad oils help me enjoy them still. You’ll come to love the pure and clean smell of them, so tell Rick good things are coming! I was diffusing sugar and spice yesterday and the kids came home and started hunting for “cinnamon rolls”. Oh how disappointed they were. Haha! 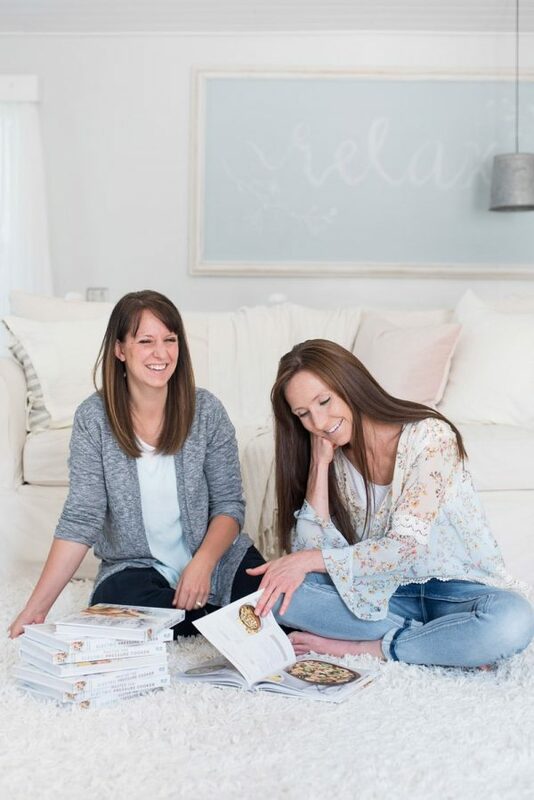 By the way – getting scheduled with your talented daughter! I’m so excited! And nervous. I’m super awkward on camera and Kevin is even worse!